NTSC DOES NOT ORGANIZE PROGRAMS DURING THE OFF-SEASON, But some of our members do! Stay in touch with some of your friends all summer long! These events and activities are listed as “member-sponsored”. They are open to club members, guests and the general public alike. Be advised that these activities are organized by individuals and not by "North Toronto Ski Club". For more information, please contact the event organizer directly. If Participating in any of the member sponsored events, you are hereby accepting the following Disclaimer: Those events are held by individuals and not by "North Toronto Ski Club", and in consideration or by participating in any of these events, you are hereby releasing North Toronto Ski Club, its directors and officers from all claims of every nature and kind whatsoever, which you may have or may have in the future against them, howsoever arising. In participating in any of these events, you are also releasing the member-sponsored organizer, any participant from all claims of every nature and kind whatsoever, which you may have or may have in the future against them, howsoever arising. Requests for listing a member sponsored events should be directed to Director, Membership and Marketing. The snow's gone and it's time to hit the trails. Spend the summer Mountain Biking and you'll be in great shape when the snow starts to fly. Beginners are encouraged to come out and try something new. We've got several rides planned at Hardwood Hills where there are bike and helmet rentals available. It's a great environment for learning and has a variety of well marked trails. Be ready to sweat, this ain't Sunday ride! Please check the mountain biking page for more info. Enjoy the company of NTSC members during the summer for some leisurely rides on Saturdays/Sundays and Wednesdays. Most rides are on roads and bike paths and are usually suitable for both road bikes and mountain bikes. Some Saturday/Sunday rides are west, north, or east of the city. Some rides are a little faster; others are a little slower. So there's lots of variety. Check out our schedule at our website: sensiblesocialcycling.ca. Sign up for our weekly email updates by contacting Larry Whatmore at Larry.Whatmore@rogers.com. Club Member Brian is back to offer NTSC members some off-season organized trips. Check out details on the 2019 Spring trip to Midland and the Fall trip to Frontenac at https://ntsc.ca/hiking or email Brian at badyc@sympatico.ca for more information. Come out, be Sensible (maybe), Sociable (definitely) and enjoy a day of Golf with old and new friends. Keep in touch by signing up for our weekly Golf email blasts. Just supply your email address to Jill Carey jillcarey@rogers.com. 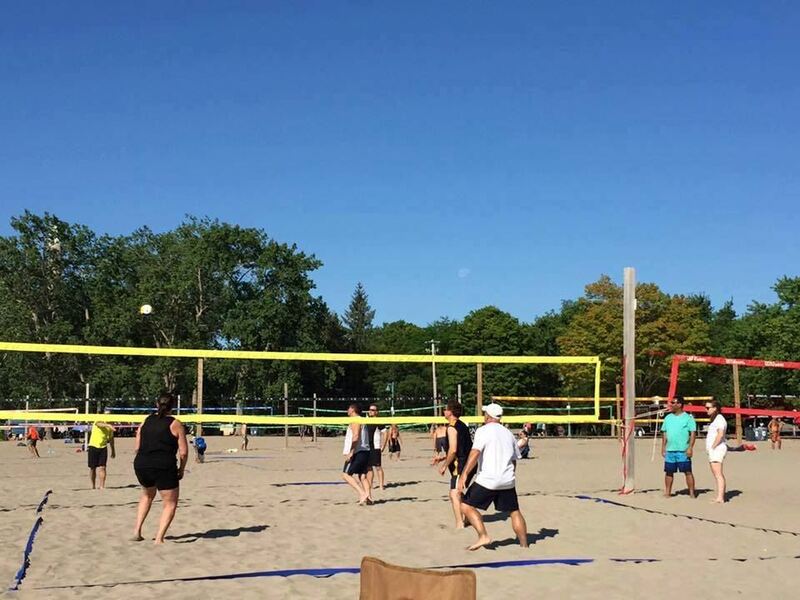 So it begins if the weather is agreeable.... a few keeners head to the beach early to secure one or two courts in a prime location. Come join us for casual and competitive volleyball games. Don't want to play? Enjoy the shade in the tents along with a cold beverage.